Lori Narlock cooking her favorite meal: Thanksgiving! Today I present the second installment of my Q+A series (check out the first here). I am very excited to introduce you to Lori Narlock. I followed her beautiful blog, Wine Country Cook, for a long time before I realized just how accomplished she is. Besides having a wonderful food blog full of simple, elegant recipes and wine pairings, Lori worked for years in professional kitchens, has authored dozens of cookbooks, and just launched an e-publishing company, Hang Time Press, with her husband. On top of all this she manages to balance a full time job and a family. Lori and I spoke about how she got into cooking, writing cookbooks, working in the wine industry, starting a publishing house, and what tips she can offer to aspiring cookbook authors. Katherine Martinelli: I know you started cooking professionally when you were in your 20s. Did you go to culinary school? Did you work in restaurant kitchens? 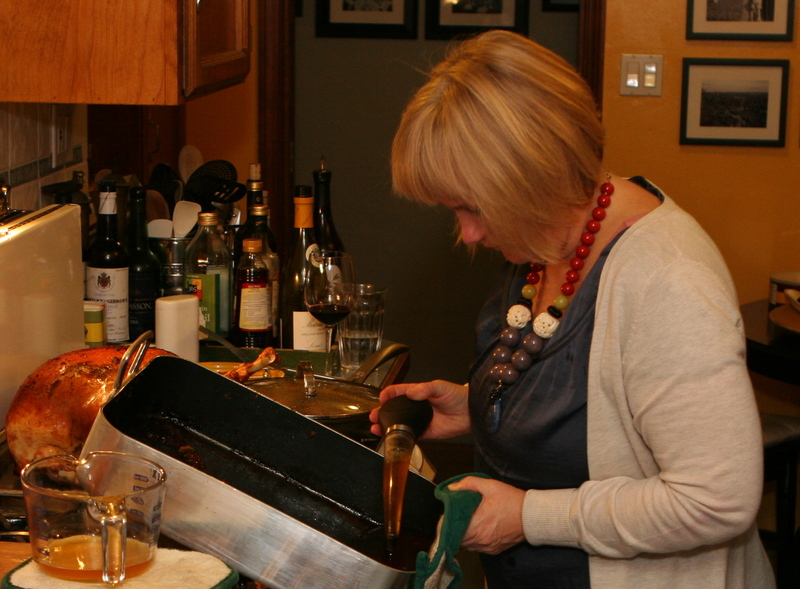 Lori Narlock: I had a sort of circuitous route to cooking professionally. I learned to cook when I was fairly young, and even cooked the family meals during high school because my parents were divorced and my brother, sister and I lived with my dad who worked long hours. When I was in college, I helped a few local families with dinner parties during the summer but it never occurred to me to be a chef. I wanted to be a writer. Then in my junior year of college, I worked for a large corporation that had a private dining room. The chef, Felicity Milne, was Cordon Bleu-trained and a phenomenal cook. Felicity cooked the most delicious food and never appeared to lose her cool, even when she was cooking for such high-profile people as Diane Feinstein, who was San Francisco’s mayor at the time. I was totally inspired. Soon I filled in for her and then the company sent me to a six-months basics course. Just as I finished the course, the company was purchased by a bigger corporation, which meant it was more likely I’d lose my job than move up. Instead of hanging out, I went to work at the Washington Square Bar & Grill, a legendary restaurant in San Francisco. It wasn’t fine cuisine, but the owner, Mary Etta Moose taught me about local and seasonal foods. After a couple of years, I left to try catering and to supplement my income I temped at a marketing company. Before long I was writing recipes for the marketing company and stretching my creative skills. The next decade or so flew by as I moved to Japan to teach English via cooking, back to SF where I worked for sake and wine producers still marrying my cooking and marketing experience. Eventually, I moved to New York and worked for Bon Appetit magazine. It was dream come true, but I was a California girl and only made it a couple of years. KM: You’ve written dozens of cookbooks. How did you transition from the professional kitchen to cookbook writing? LN: When I moved back to San Francisco, I turned back to catering while I figured out the next step. I worked for Thymes Two, a catering company run by twin sisters, Mary and Sara Corpening. After a few gigs we started chatting about cookbooks and the ambition we all shared to write one. One day, Mary suggested “Smoothies,” a trend that was just emerging. I wrote the proposal, we submitted in to Chronicle Books—they nearly turned us down—and it went on to sell copies beyond any of our wildest imaginations. We wrote a few more together in quick succession. KM: You now work in the wine industry and author the wonderful blog Wine Country Cook. Are you originally from California? How did you develop an interest in wine, and in wine and food pairings? LN: By the time I had finished my first few books I was living in Napa near my family. I started doing some projects for one of the Robert Mondavi wineries. The wine business was a whole new world and I loved it. I soaked up everything anyone said and tasted everything I could. One winery project led to the next and I began to take on various writing and cooking projects, including ghostwriting the “Cakebread Cellars Cookbook”. Writing the Cakebread cookbook was like returning to cooking school. Every day I went to the winery, where the winery’s chef, Brian Streeter and I would settle into a small kitchen for that day’s activities. He’d cook and I’d watch and write. At lunchtime, the Cakebreads would meet us at the kitchen and we’d taste through the recipes along with wines to pick the best matches. KM: When did you start your blog and how did it come about? LN: Living in Napa, I’ve been extremely lucky to be surrounded by really talented chefs and to learn so much from them. The Valley also has an amazing community among the farmers and the chefs, which inspired me to write a book called, “The Food Lover’s Companion to the Napa Valley.” While researching my book, I met with every farmer, ate at every restaurant, shopped at every food store and talked to lots and lots of people. It cemented my respect for people who grow, produce and prepare food and I totally fell in love where I live. When the book was finished, I started a blog as a sort of supplement to the book. There was an earlier version that never found its groove. I took a break from blogging and then started Wine Country Cook. It was a little bit impulsive, but it took only a post or two before I knew how to give it focus. I’ve been incredibly diligent in posting once a week, with just a few weeks missed—mostly lately because my life has become incredibly busy as my husband and I have launched our own publishing house. KM: You are incredibly busy as a mom, blogger, and publisher, plus you’ve written a novel (to be published on Hang Time Press) and have a regular 9-5 job to boot. How do you balance everything? LN: I wish I could say I do balance it all or that I can do it all, but the truth is something always is sacrificed. Right now, I see my friends a lot less than I’d like. It’s been ages since I’ve had a girls’ night out. I really miss that social part of my life. KM: You and your husband, Jack Irby, recently launched an e-book publishing company, Hang Time Press. What was the inspiration behind this? How did it go from dream to reality? LN: Ironically, it was the encouragement of a friend as we drove home from a girls’ weekend last spring. She encouraged me to write a small book about crockpots. I thought it was a good idea so I dropped everyone off, went home, showered and went to Target to buy a crockpot. Somewhere between pulling it out of the back of the car and walking in the kitchen door, something changed and when I walked in I told Jack we were going to start a publishing company. He’s a tech whiz and together we have the perfect blend of skills to start a new-media publishing company. It’s been a wild ride. In about eight months we’ve gone from zero to being a real company with writers under contract. We are really excited about the potential of this new frontier. Some days it’s a little overwhelming, but mostly it’s just exciting. Ironically though, the crockpot is still in its box. I’m sort of tempted to leave it as is, but I think I’ll pull it out this winter and play with it. KM: What is the idea behind Hang Time Press? What kind of books will you be publishing? Are you accepting submissions? LN: We publish only ebooks. We are initially focused on mini cookbooks. We want to grow organically, but we do have plans to start adding full-length non-fiction and fiction books. The best part of this business model is the production costs are relatively low, so we can take risks print publishers can’t. This allows us to publish more authors and we are considering proposals from anyone with a desire to write a book. On our website, hangtimepress.com, we offer information for creating a proposal. KM: Do you have any advise or tips for food bloggers who would like to pursue having their own cookbooks published (with you and in general)? LN: Be prepared to work 10 times as hard promoting your book as you did writing it. There’s more opportunity, but writers still need to talented and marketing savvy. Also: don’t’ give up. If someone says no, keep knocking on doors. And lastly, follow your heart. It sounds simplistic, but you need to do what makes you happy and when you write about what you feel passionate about your writing will always be good. And at the end of the day it really is all about good writing. This was a good read. I liked finding out about the journey of successful people in the food industry be it writers, creators or business owners. It is also a very inspiring piece. Thanks for the into to Lori. Thanks Tina! I’m so glad you enjoyed this piece. I have also greatly enjoyed getting to know Lori and think her path is so interesting! We’d love to find out more about your book idea. We’re still working on an easy form to create a proposal but there is some information on our site so please look at it and feel free to contact me directly at anytime, lori at winecountrycook dot com. Thank you Theresa!! I’m so happy to hear that 🙂 Happy belated Hannukah, and happy new year! Lovely post, and great interview..enjoyed reading very much!!! Wish you both Happy Holidays season! !